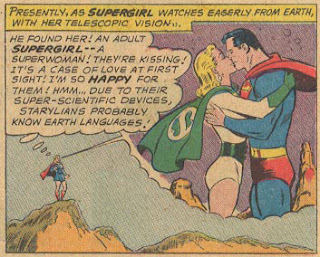 In reading tales concerning the life and times of the good ol' Man of Steel I've noticed something: Superman's love life is often pretty creepy. 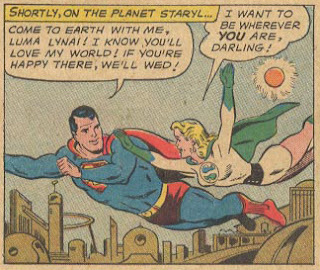 Now I'm not referring to the eternal distance that he maintains between himself and Lois Lane/ Lana Lang - that's just perplexing - and I'm not talking about the one time that he was willing to settle down being with a mermaid. I'm talking about how he keeps trying to make time with his relatives. Now, I can kind of almost see the reasoning behind this tendency, from a writing standpoint. Pre-1985, Superman is ridiculously powerful - easily the strongest, most invulnerable dude in the DC Universe. For him to have anything approaching an equal relationship, power-wise, he'd pretty much have to date inside his family. This, however, does not make the concept any less creepy. To show you precisely what i mean, here's some picture evidence. 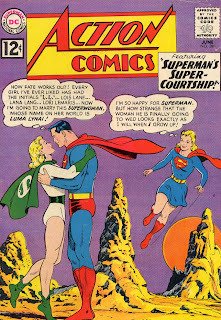 Supergirl saw a movie about a sorrowful bachelor, which naturally gets her thinking about her cousin Kal-El - what if he never gets married? Basically, civilization as we know it would crumble. 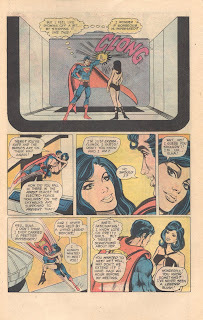 Supergirl decides to find a suitable dame for Superman, resulting in not a few hijinks - she tries Helen of Troy first, but Helen turns out to be something of a colossal wench, and so she's out. 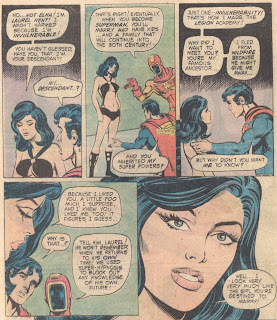 Then she tries to get him together with Saturn Woman of the grown-up Legion of Super-Heroes, but she turns out to have gotten married, so that plan is also out the window. Sheesh! 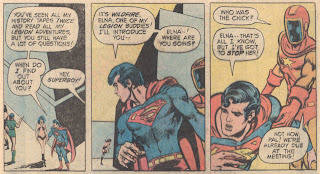 Aw, Superman... that's just, um... incredibly wrong. Look at how he's got her chin, and how close he's standing... he completely *wants* his fifteen-year old cousin. 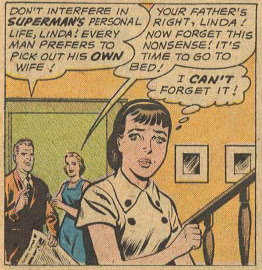 Not only that, but Supergirl can tell - check out the expression on her face - she's freaking out, probably because she remembers this incident. 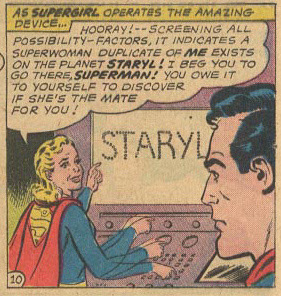 So the justifiably-freaked-out Supergirl rushes off and finds somebody to take the bullet for her - her super-powered doppelganger on the planet Staryl. 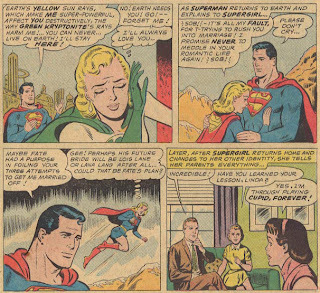 But it all ends in tears, in the good ole DC manner - Supes doesn't even think about staying on her planet (or visiting occasionally for some super-nookie, or trying to solve her problem, or anything else) , he goes home to hug Supergirl some more, and everything goes back to normal, except that the Man of Steel now creeps everyone out. Not that he gives up, as seen in the very brief appearance of Creepy Object of Desire No. 3: Your cousin, just from another dimension. See? 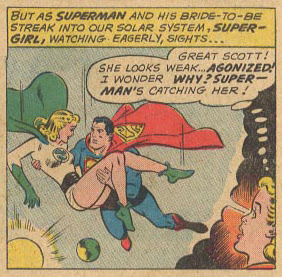 He's totally folding under the mild flirtations handed out by his extra-dimensional cousin. Don't do it, man! Check the DNA! No resistance to kryptonite, magic, or gettin' some. "Trophy room" my eye. And she's his descendant. Which probably messed up his libido for a while - maybe that's why he grew up to be the kind of guy who hits on fifteen-year olds that he's related to. All in all: Bad form, Superman. Bad form.